Highfield Discovery Garden (admission fee is $5/adult, $4/kiddos 2-12) at Glenwood Gardens is where nature and fun intersect. 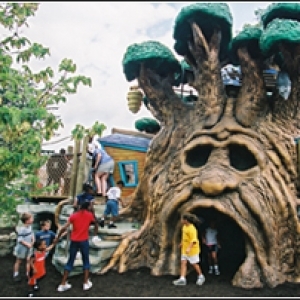 They have a kid friendly tree house called the Discovery Tree in the middle of the park where they can climb and explore. They also have the most adorable little gardens dispersed throughout. There's a little tiny house perfect for little ones to have a tea party. They also have a mini train display in the Trolley Garden and the kids can pretend they are the conductors and press the light up buttons in the train station to make it go. There's a sweet nature center with nature programs as well as hands on things for kids to do - puzzles, puppets, games, etc. There usually is a program going on that the kids find exciting and parents can even learn something too. A Fairy Garden was added as part of the Wizard's Garden and it is something to see.